SKU: Plastic name Plate 2x10"-02. Category: Desk Name Plates. Personalize your office space with your own custom engraved name plate. 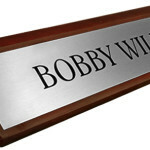 Our plastic name plates are engraved using 2-ply plastic and are offered in a variety of colors. Use our product designer to customize your own. If our online options do not support your needs, please contact us at 409-886-1363.